Have you ever wondered how is glass made? Toughened glass is made from normal, float glass. This page gives you all the details you need to know. In the toughening process, the surfaces of the glass are heated in a furnace. Recommended temperatures vary but the glass reaches temperatures of over 600°C. The hot glass is then cooled rapidly by a blast of air over a period of between 3 and 10 seconds. As a result, the surfaces shrink, and (at first) tensile stresses develop on the surfaces. As the bulk of the glass begins to cool, it contracts. The already solidified surfaces of the glass are then forced to contract, and consequently, they develop residual compressive surface stresses, while the interior zone develops compensating tensile stresses. 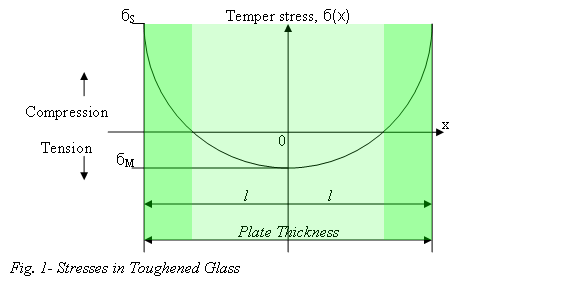 The tension zone in the core of the glass takes up about 60% of the cross-sectional area of the glass. Compressive surface stresses improve the strength of the glass in the same way that they do in other materials. The nature of the stresses is depicted in Fig. 1. After the process the toughened glass has a greater resistance to thermal stresses and thermal shock and has improved flexural and tensile strength. However, following characteristics remain unchanged; •	Colour, •	Clarity, •	Chemical composition, •	Light transmission, •	Hardness, •	Specific gravity, •	Expansion coefficient, •	Softening point, •	Thermal conductivity, •	Solar transmittance, •	Stiffness. The higher the coefficient of thermal expansion of the glass and the lower its thermal conductivity, the higher the level of residual stresses developed, and the stronger the glass becomes. Thermal toughening takes a relatively short time (minutes) and can be applied to most glasses. Because of the high amount of energy stored in residual stresses, tempered glass shatters into a large number of pieces when broken. The broken pieces are not as sharp and hazardous as those from ordinary glass. Above is a representation of the main elements of a glass toughening facility. The size of the machinery required is dependant on the size of toughened glass parts one wishes to produce. However, for example a 1200 x 1300 mm bed which is designed for producing small parts, such as door panels would cost £140,000 + VAT (LGT Limited). This is towards the lower end of the price scale but second hand systems can be purchased for less. If you need some toughened glass, contact us with the details.